Homes for Sale in Coventry at Anthem. 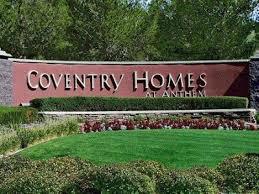 Anthem Coventry is one of the most sought after neighborhoods in Henderson, Nevada. Located north of the popular Anthem Country Club lies the beautiful community of Coventry. It sits on about 55 acres of land that has beautiful lush grass and gorgeous views of the mountains. The lot sizes in Coventry are very desirable because they are larger than a typical lot size in a community, making many people want to live here. The community has a park with areas for walking, biking, and jogging, hiking. There are also basketball courts, soccer fields and baseball fields available as well. Also, Anthem Coventry has strong community participation and hosts many events throughout the year. Contact Tracy Drown for Real Estate at 702-245-9341.